Today has been windy and cold and pouring with rain... pretty miserable really. But great weather to be inside listening to nice music, drinking herbal tea and working hard. Which is exactly what I've done. I've spent the whole day being very productive updating my website and my shop. At last, hooray! It feels great great to get on top of really big jobs like that. Here's my new shop banner... after seeing Roxy as a tot, here's a recent shot of her playing with her Sweetie collection. Great news for me that it's done, and good news for you too. As a very much appreciated reader of the red thread blog you can get a 15% discount off anything in my shop (not the website, just the shop) for the next week. All you have to do is put in the code MAYBLOG at checkout. The Ooshka and Hello Birdy sewing patterns are now in the shop. The not so good news... after doing an inventory for the shop update I have realised that I have pretty much sold out of the Cuddle Bundle (sometimes known as Sweetie Beans because I still haven't made a decisive decision on the name!) panels. Eeeek, sorry! 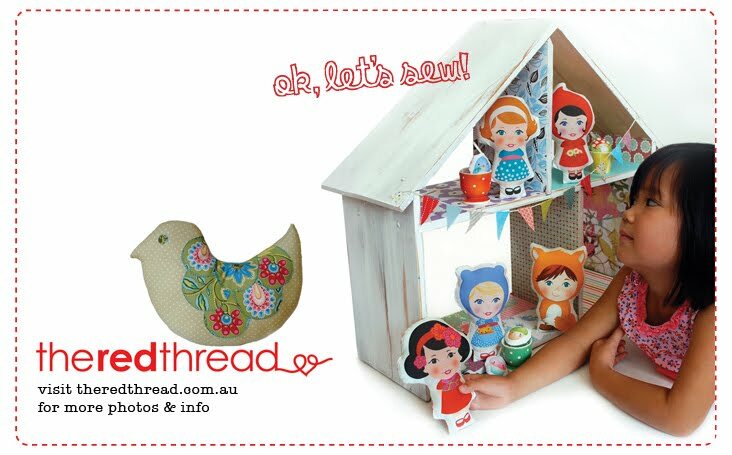 I'll be having more printed soon and I will be selling the Cuddle Bundles softies at Handmade in Canberra next weekend.